We all love a good drag show and when one pops up that is defiantly different, first we raise an eyebrow and then embrace the new with open arms. 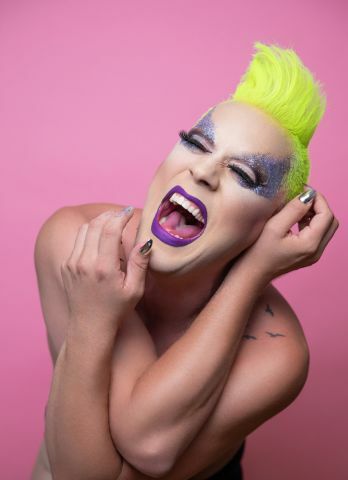 Velma Celli, aka Ian Stroughair, delivers a novel new show that is honest and bona fide authentic. More importantly it is his own personal story as a musical theatre artist and journey into solo performance. While working in the West End on endless Chicago performances he goes out one night in drag with cast members from Priscilla Queen of the Desert. He finds himself singing his heart out at Karaoke night, at a bar where he is instantly hired as a regular drag performer. Yet to have a drag name, the night ends in Chinatown - while slurping on his noodles he comes up with Velma Celli (vermicelli). Velma Celli is stripped back, short cropped hair, high-heels and a glittery slip dress belting out torch songs with passionate zeal. He carries a distinctive low -key style that is so fashionably camp with stories of life on the road. His love of pop music is evident with his song choices, and his inspirations are gained from the rock greats like David Bowie and Freddie Mercury. Celli feels the pressure and is determined to give his best; he is tenaciously unbreakable. He challenges his vocal range with a collection of song medleys from Whitney Huston, Cher and Anastasia. His back-up singer Eliza Jackson and pianist Domenic Woodhead add to the cabaret like ambience.